The search function can be found by clicking the “Search for Public Contracts” link on the Welcome page. Clicking on the “Search for Public Contracts” link will bring up the “Contract Search” page (Fig. 1). Documents may then be retrieved using either the “Keyword(s)” search feature or by using the “Search Using Other Terms” feature. The “Keyword(s)” feature and the “Search Using Other Terms” features cannot both be used for the same search at this time. The search function will be enhanced in the future to allow keywords and other terms to be used in combination on searches, allowing users to refine their requests in order to better identify the contracts they are interested in reviewing. You can enter one or more words into the “Keywords” textbox (Fig. 2) to search for contracts. Words that are likely to appear in desired contracts or words that otherwise describe the goods or services to be provided through those contracts are likely to be the most successful as keywords. By putting double quotes around a set of words, you are telling the search engine to consider the exact words in that exact order without any change. For example, a search for "KORYAK Consulting" (with quotes) will bring in all pages containing that phrase but won't bring in documents that may have "KORYAK, a consulting company from Pittsburgh". Attaching a minus sign immediately before a word indicates that you do not want pages that contain this word to appear in your results. The minus sign should appear immediately before the word and should be preceded with a space. For example, anti-virus -software will search for the words "anti-virus" but exclude references to software. You can exclude as many words as you want by using the - sign in front of each of them. The *, or wildcard, is a little-known feature that can be very powerful. If you include * within a query, it tells the search engine to try to treat the star as a placeholder for any unknown term(s) and then find the best matches. For example, the search maintain * standards will bring in documents that may have "maintain the highest standards" or "maintain the lowest standards" or "maintain no standards". Note that the * operator works only on whole words, not parts of words. The search engine employs synonyms automatically, so that it finds pages that mention, for example, childcare for the query child care, or Pennsylvania history for the query pa history. But sometimes the search engine helps out a little too much and gives you a synonym when you don't really want it. By attaching a + immediately before a word (remember, don't add a space after the +), you are telling the search engine to match that word precisely as you typed it. Putting double quotes around the word will do the same thing. The “Search Using Other Terms” features (Fig. 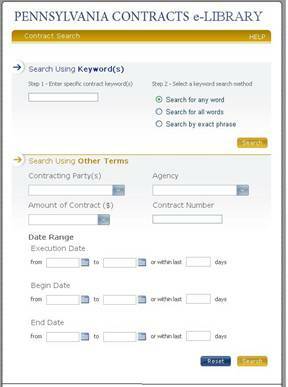 3) give you additional search capability by focusing on certain specific aspects of contracts. 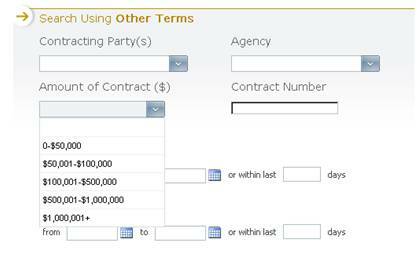 The “Contracting Party(s),” “Agency,” “Amount of Contract,” “Contract Number” and “Date Range” features may be used individually or in any combination to locate contracts. The more options chosen, the more refined the search will be. Clicking on the “Search” button initiates the search function. Clicking on “Reset” will delete all entries, allowing the user to enter terms for a new or edited search. These two search features (Fig. 4) offer dropdown lists of all agencies and contracting parties in the e-Library. You may search for only one agency and/or one contracting party at a time. The “Amount of Contract ($)” search feature (Fig. 6) is also a textbox that provides a drop-down list, in this instance with contract dollar value ranges. You may only select one range at a time for a search. The available ranges are shown in the example. The “Search by Contract Number” feature (Fig. 7) can be used to locate a contract with the exact contract number that has been entered in this textbox. After the number is entered, clicking on the search button will retrieve only the specified contract. It is important to note that there is no universal numbering system for Commonwealth contracts utilized by agencies whose contracts are available from the Contracts e-Library. Thus, it is very possible that different contracts, entered into by different agencies, can bear the same number. Users can avoid having to review search results that contain multiple contracts from different agencies with the same number by using both the “Contract Number” and “Agency” search features when possible to narrow the search results. The date ranges or searches “within last x days” (Fig. 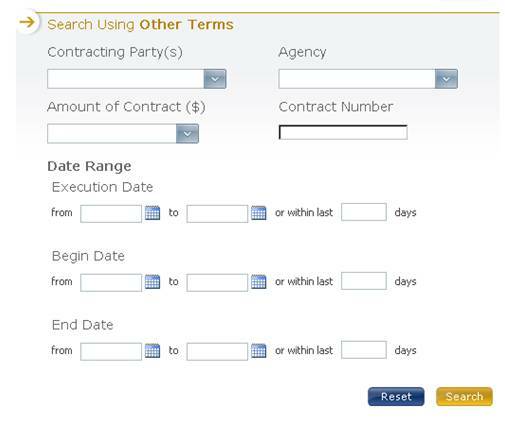 8) are available for all three kinds of contract date searches that can be performed (Execution Date, Begin Date or End Date). 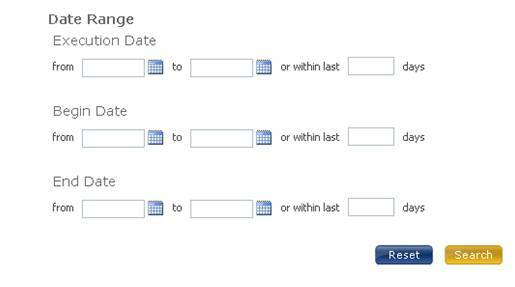 As with searches employing other contract terms, users can combine any of the three date ranges to narrow their searches. You may enter dates manually using either standard date format (mm/dd/yy or mm/dd/yyyy) (Fig. 9). Using the Date Range feature will only retrieve documents that fall within the specified date range(s). 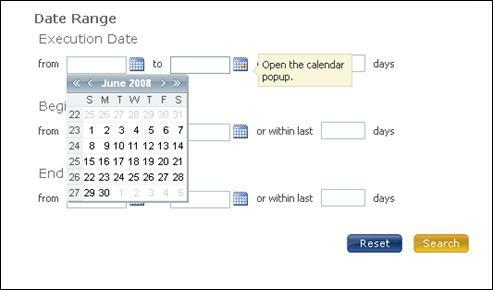 You can also enter dates using the Calendar box shown to the right of each date’s textbox (Fig. 10). Clicking on any date on the calendar popup will place that date in the selected textbox. Documents may also be searched using the “within the last x days” feature (Fig. 11). 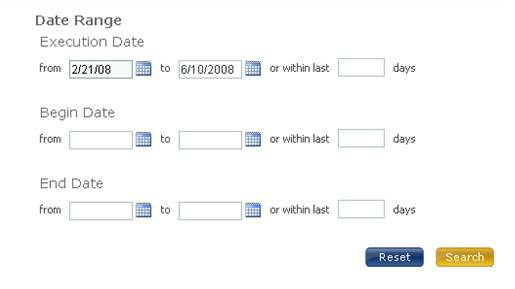 Entering an amount in this box will retrieve documents with dates that fall within this range. Again, after filling in the desired information, clicking on the “Search” button will initiate the search function. 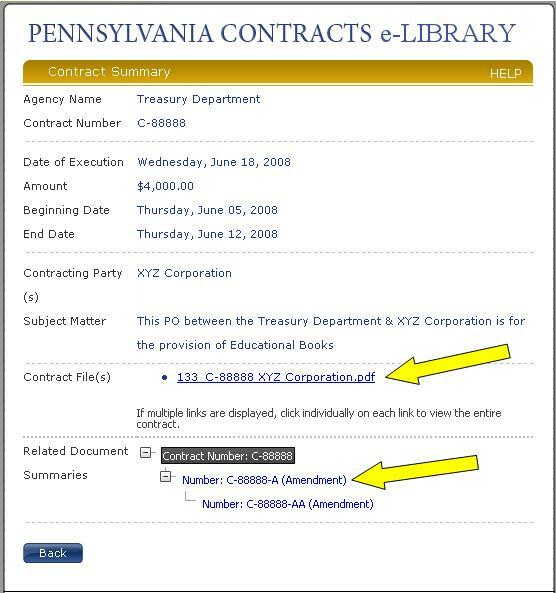 Results from either a “Keyword” search or a “Search Using Other Terms” will provide the “Contract Number,” “Agency,” and a brief description of the subject matter of all contracts fitting the search terms (Fig.12) Clicking on either the “Contract Number” or the “View” button on the “Contracts Search Results” page for a specific document will bring up the full “Contract Summary” related to the contract provided to the Treasury Department by the agency. 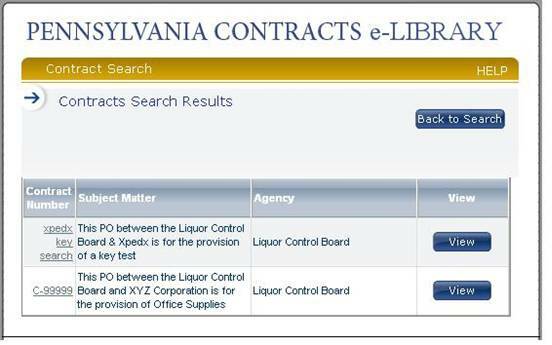 The “Contract Summary” page lists important information regarding each contract (Fig. 13). The information includes the “Contract File(s),” which are links to one or more files that contain the contract and any appendices, exhibits, tables or other attachments. The “Contract Summary” page also includes links to “Related Documents” to the contract, which are amendments, purchase orders, and other documents that relate to or have been issued against the contract. You can click on the link in “Contract File(s)” to view the contract (Fig.14). ” If multiple links are displayed, click individually on each link to view the entire contract. Clicking on this link (Fig.14) will bring up a copy of the contract (Fig.15). 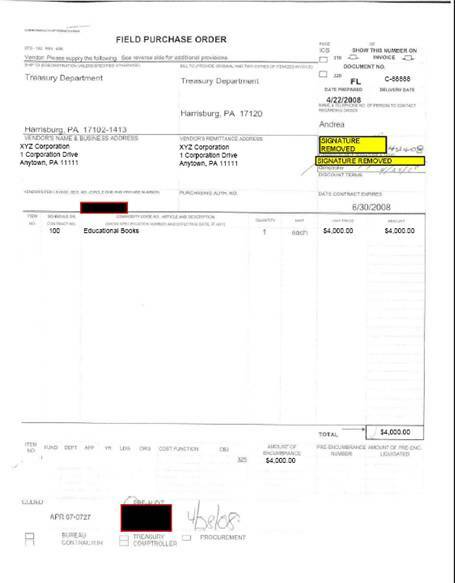 As the example shows, some documents may have had sensitive or non-public information removed by the agency prior to submitting it to the Treasury Department. A description of redaction, or removing sensitive or non-public information, can be found in the FAQs section of the Contracts e-Library. Clicking on any “Related Documents” (Fig.16), will bring up the “Contract Summary” page for that related document. A copy of the related document can then be viewed by clicking on the link in “Contract File(s)” on the Contract Summary page for that related document. If a contract or related document is not currently available to be viewed, the system will display the “No files found” message (Fig.17). You can request that a copy of the contract or related document be added to the Contracts e-Library by clicking on the “Request contract” button. The system will then display a message advising that the document will be available for Public Viewing within five days (Fig.18).